We have a good friend who is an airline pilot. One night, while chatting, she revealed that airplanes are not as clean as you’d think. They typically look clean because they get vacuumed, but considering they spend very little time on the ground between flights there rarely is time for a deep, thorough cleaning. All day long, people with colds and other illnesses get on and off the plane. The flight attendants do pick up trash, tidy the cabin and put the seat belts neatly across the seats, but that’s about it. This lines up with our experience: I noticed over the years that whenever we flew somewhere, I’d often be sick a few days later. We figured we’d been around new germs and that it was par for the course. But then our pilot friend gave us a tip that made so much sense: bring Clorox Wipes on the plane with you. 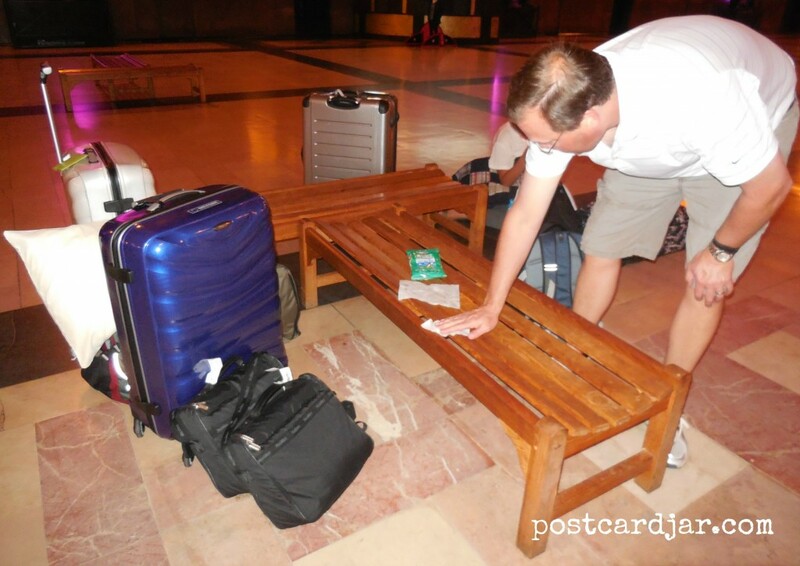 Now when we board, we quickly grab a wipe and clean the arms of our seats, the seatbelt, the seat belt buckle (being sure to get under that flap), the tray tables and those little things that swing around to hold them in place. Basically, we give a quick once-over to anything near our seats that we might touch. People look at us strangely, and we have to work hard to keep our fannies out of the aisle while others board, but I stopped getting sick after flying. So you know what? 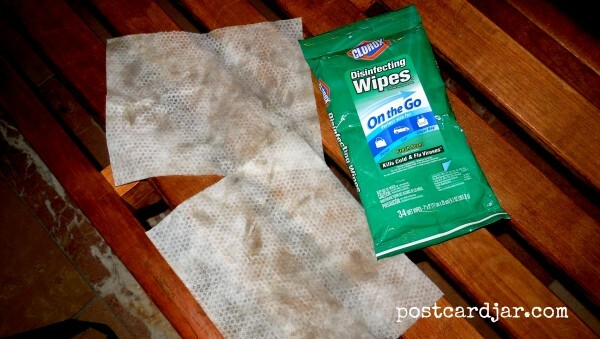 We started bringing wipes to hotels because we’d heard that hotels can also be places for germs. 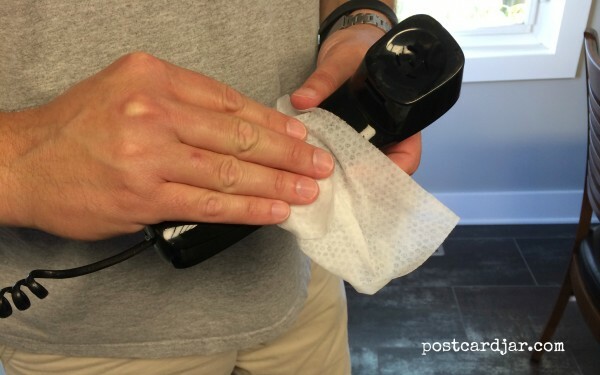 Now when we check in to a hotel room, we take about three minutes to grab a wipe and clean things like the remote control (which half the time is sticky, anyway), light switches, and the phone. Basically, we try to think of the things housekeeping wouldn’t normally clean but probably get a lot of dirty finger traffic. Speaking of dirty finger (and other parts) traffic — we recently spent five hours at Union Station in Kansas City while waiting to board an Amtrak train late at night. Before resting our heads on a bench in the Great Hall, I took our Clorox wipes to the seats, which had already been cleaned by the night cleaning crew. Here’s what I got. Moral of the story, if you don’t have time to have bronchitis (‘aint nobody got time for that! ), then bring along a travel pack of Clorox Wipes or some other brand of disinfectant, and be well even after you get home. 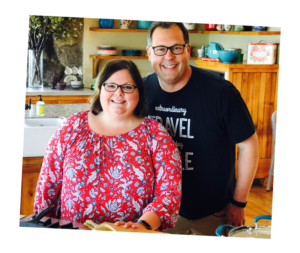 Given the fact that Ann is taking medication that suppresses her immune system, this is one tip we follow each and every trip. How do you stay healthy when you travel? Let us know in the comment section. We’d love to hear from you. 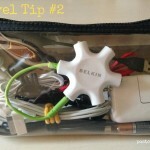 Travel Tip #2 - Put all of your cords in one see-through bag.